This beautiful building has a long and colorful story. Since the 19th century it has been a big part of Reykjavík’s history.In 1863 a man named C. P. A Koch was granted a permission to build the house with a pier in front, on the condition that a passageway through the house would be open to those who needed it. The building only had one floor, and was used as a warehouse and an office for the sea post.It was called the Pier House.Because of its location the house became the unofficial gateway to the city, and a bustling scene of fishermen, traders and travelers. 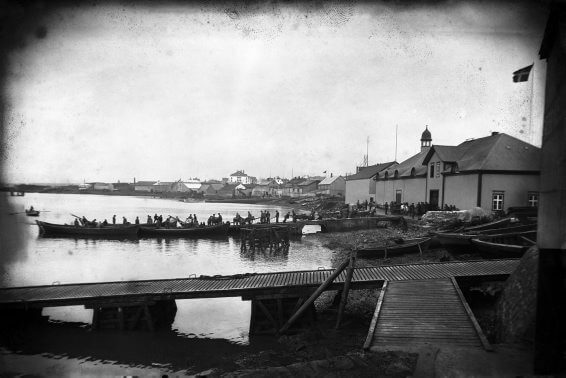 You could say that it became the unofficial gateway to Reykjavík city, since travelers arriving from other parts of the country and abroad all had to go through the Pier House.Every time a ship arrived to the pier it filled with people waiting to hear news from their loved ones abroad. The year 1888 the Council of Reykjavík decided to give numbers to all houses in the city. As the central point of the old town centre, the Pier House was given the first number: Vesturgata 2 (West Street 2). When standing outside the building, in all directions you look at the number of houses will ascend. So the house is literally the exact centre of Reykjavík. Over the years its role has alternated between warehouse and shop, offices, nightclub, café and more.Today it is one of the biggest restaurants in Reykjavík. Koch was granted permission to construct the building with a pier in front, on the condition that a passageway through the house would be open to all others. The house was known as the Pier House at that time, and used as a warehouse and an office for sea post. The house was bought by a Danish merchant named Waldemar Fischer, who used it as a warehouse for his store. The pier then became known as Fisher‘s Pier. Reykjavík Council decides to number all houses in Reykjavík. As the central point of the old town centre, the Pier House was given the first number: Vesturgata 2 (West Street 2), buildings on the other side of the street were given odd numbers. Waldemar Fishcer set up a textile store in the building. The H.P. Duus company bought the Fishcer‘s stores along with the Pier House. The company used the house to store coal, salt and fishing gear. After that the pier was called the Duus Pier. A warehouse was built on the eastern side of the Pier House, a wooden building on a single floor with a low roof. The following year, the whole premises were covered with a hipped roof and cambered gables. The Nathan & Olsen trading company bought the Pier House and added the upper floor, giving the building its present form. The passageway was probably closed at around the same time. Another floor was added to the warehouse om the eastern side in 1938, thereby merging the two buildings. The modifications were designed by the architects Sigurður Guðmundsson and Eiríkur Einarsson. The building was bought by the savings bank Verslunarsparisjóðurinn. Shortly afterwards it was bought again by Loftleiðir the airline company which later merged into Icelandair, to house its main office and sales office. Álafoss Wool Factory bought the premises and undertook extensive modifications. Valur Magnússon opens a night club called Kaffi Reykjavík, later on it changed owners. Valur buys Kaffi Reykjavík again and opens a restaurant under the same name. The name was changed to Restaurant Reykjavík. In Mai 2012 Þórður Bachman and Hafsteinn Häsler bought the restaurant, dedicated to upgrade its quality on all levels. Today it’s one of the biggest restaurant in Reykjavík.